You can select up to 3 charities to support. Your charities will receive 1% of each transaction from Bi-Lo. For more information go here. 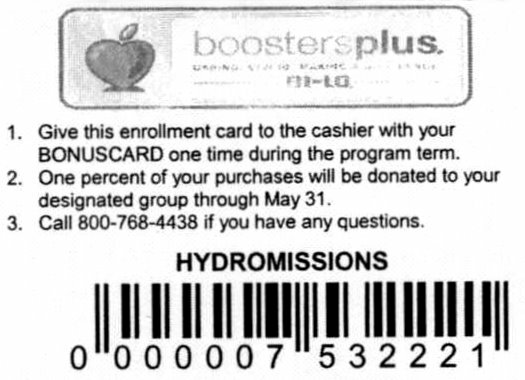 Get an enrollment card from the organization you want to help. Have the cashier scan your Bi-Lo card and the enrollment card, this only needs to be done once to link them together. If you would like some ideas, try your local school, shelters etc. One mission idea we love is called HydroMissions, they help provide fresh water in 3rd world countries. They are based in South Carolina and would love more support. You can get the enrollment card here, if you would like to help support them. You can select 1 charity for the year. Each year you will need to reselect a charity. Select a Charity that you want to support. You need to get a key tag from the charity that you would like to support and scan this every time you shop. If you also use the Publix Upromise key tag, they can be scanned in the same transaction so it won’t affect your college savings. Many stores keep key tags for schools in their area at the registers. You can link your card to one charity each year. Go here to find your charity and get set up. Link to one school each year. No other types of organizations are participating. Go here to find the school you would like to support and get you Vic card linked automatically. Link to one school each year. No other types of organizations are participating. Go here to find your school and get your Advantage Buy Card linked. Link to one school each year. No other types of organizations are participating. Go here to get your Harvey’s key card linked automatically.